After perhaps reading too much about Hypermedia (too much hype?) I started getting the itch to do something. This quick blog is a record of the steps I took towards a Hypermedia “hello world”. The main tool I used was a plug-in REST client from Mozilla but anything that lets you set headers and inspect responses will do the job. For this exercise I choose three popular Hypermedia designs: HAL, Collection+JSON and Siren. Each design has a high-level of abstraction making it suitable for re-use and an active community of developers who are busily engaged with various implementations. Mike has documented the HAL design by providing an interactive HAL Browser. This is the most immediate way to say “hello world” in Hypermedia style. Firstly you use the HAL browser to create an account (hint: see the hints :-)). Next you should navigate to /users/:account and then use the NON-GET button to get into the following dialogue box. It’s okay if you type something other than “hello world” *yawn* but changing anything else might break something .. To verify your creation navigate to the latest posts and as-if-by-magic your entry will appear (fingers x). The HAL browser is great way to quickly get a feel for what HAL is all about. Armed with this knowledge I wanted to take a step towards a HAL client that could be controlled independently, and ultimately deployed in another context. The HAL browser seemed tightly coupled to the server, so rather than unpick it, I dug around and found another server running on the HAL builder site. I made the following request using my trusty REST client. And in case you weren’t paying attention earlier, here’s a picture. The HAL builder dutifully obeyed my request (yes, the Accept header is necessary) and gave me the following response. Now if I was a robot, I would crack-on and apply some automation to the above. Here are our first clues about Hypermedia. Custom media-types and machine-based connections! There’s way more discussion about using HAL in the forum. And just like HAL, Collection+JSON has its very own registered media-type. 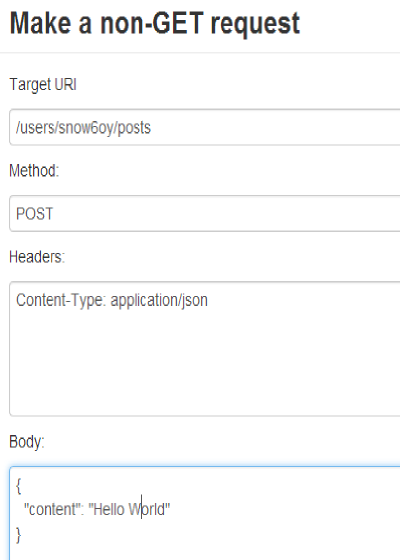 To get a test response from Collection+JSON we’ll return to our REST client. As before set the client up for the target service and specify the media-type. This Hypermedia server responds with the following. Graphviz is open source graph visualization software. The Graphviz API was designed to allow new users to register, add graph definitions and retrieve those definitions in various representations (pdf, jpg, png, gif). From the example API requests that are available in the Graphviz documentation, this looks like a well-conceived implementation of Collection+JSON. As authentication is required to use the Graphviz service I decided to continue my tour and found a Collection+JSON Browser. The browser functions much like the HAL browser except that the Hypermedia server is de-coupled from the client. The example Employee data is open and this means we can hit the endpoint directly from .. yep that’s right our friend the REST client. 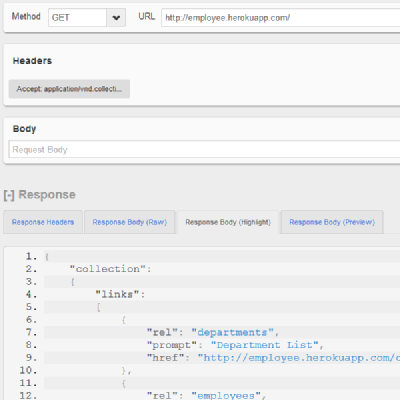 The above example shows a response from the Employee test data. Like HAL, Collection+JSON has a strong developer community. And like HAL and Collection+JSON, Siren has a registered media-type. To make our “hello-world” request to Siren we’ll use a Siren Browser developed by Wurl. Incidentally it’s great to see commercial API providers, such as Wurl and Graphviz embracing Hypermedia designs (this is the future :-)). 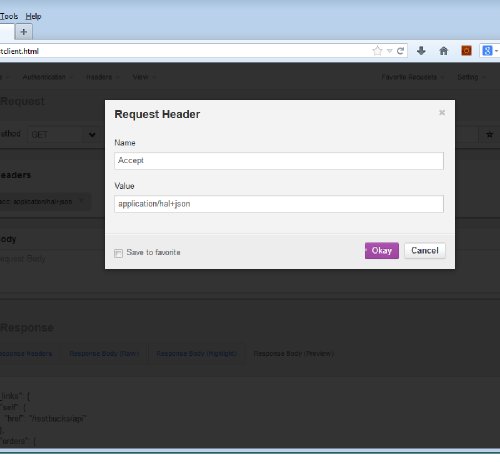 Let’s point this Hypermedia client at a test Hypermedia server that Kevin has running on heroku. As this service is read only (404, “Cannot POST /users”) we cannot use it to make a “hello world” but the action for creating a user seems clear enough from the response to the initial GET. Here is the response. It has been trimmed down to the essential bit. Like the others, the Siren gang also hang out and share stuff. Something that all of the three Hypermedia designs have achieved is that at no point was it necessary to Read-The-Fscking-Manual. This is a Very Good Thing for Developer Experience. This is another clue for our understanding of Hypermedia design. Self-discovery! As said earlier, each design also has a high-level of abstraction. The flexibility provided by this abstraction does however make design selection seem rather arbitrary. Which of the three Hypermedia designs are right for me?!? I hope this will be the subject of my next excursion. Thanks.